Bed bugs are inherently one of the most difficult bugs to remove. What makes this product so special that it out performs other products? From a manufacturer review to competitor analysis, this review aims to find out how well this stuff actually stacks up. The overall response is that users have had some success with this product. What it MIGHT mean is that it is a semi-reliable addition to your bed bug killing toolkit. People who have found success with this product often use other products such as bed bug ﻿﻿traps, encasements, and a decent exterminator to get the job done. "Just another okay bed bug killer and a decent addition to your bed bug killing toolkit." Harris is a bed bug spray contact killer, which means it doesn’t do anything to bugs that are hiding in the cracks and crevices of your home. To kill eggs, you'd need to find them, and spray directly in order to see any effect. Our rating came in at 3 stars because there have been some reports of people finding success with this product. As far as bed bug killers are concerned, you generally want to avoid sprays mainly because it's so easy to mess up your application. More likely than not, you'll end up over applying insecticide around your house and disbursing the bed bugs making your problem worse. If you are still considering this product, keep reading for more information! We’ve seen that Harris may or may not give you the results you’re looking for. Let’s take a look at some of the pros and cons. Contact killer with long residual effects. Versatile against other pests, including roaches. This doesn't kill the eggs effectively. Bulky container. Some people send up poring the liquid into smaller containers. Sometimes leaves a chemical smell despite claiming to be odorless. Residuals may not be as strong as claimed in the product's marketing. Some bugs can develop resistance. This section looks at some of the key features of Harris Bed Bug Killer. 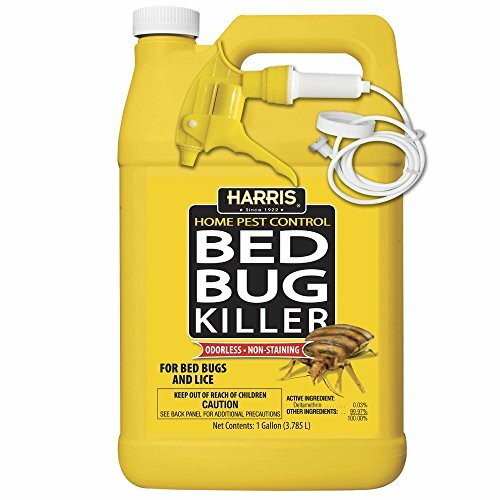 Harris is a liquid spray that you can apply directly onto the area where you think the bed bugs are residing. The container comes with a nozzle that allows you to spray it and it’s safe to use on your mattress and furniture. After spraying, the liquid dries within minutes and you can return to the room. Harris claims to be odorless and safe to use around the house. This is a great feature compared to others that leave lingering smells, especially since the spray is for indoor use. Some people claim that there’s a faint chemical smell which persists for several hours after use. Compared to other products, this is much less pungent and the smell dissipates quickly. This is another great feature that makes it safe to use in your house without having to worry about damage. A fine film does remain, but it’s relatively safe and is relevant for the residual effects of the spray. Other products do stain furniture and can become a problem for homeowners. The long last residuals are one of the key characteristics of Harris Bed Bug Killer. This claims to kill the bugs for seven to ten days after the first use making it great to stop the spreading. The product also tells you that you need to use it on a regular basis. This starts off with daily sprays before reducing it to two or three times a week. Then, you’re suggested to spray once a week. This maintains a dose that can kill and deters the bugs. Harris is mainly designed for indoor use only, but if you believe you may have part of your infestation residing outside your house, feel free to spray accordingly. The Harris brand has been around for almost a century starting in 1922. They are one of the oldest EPA registered pest brands in the United States. More than 55 Harris products are registered. You can buy different types of natural insecticides against a variety of pests (roaches, scorpions, etc). Harris makes their own products and is a very well-known company in the US. You can read more about the history of the company here. Harris products come recommended across a range of other pest control websites. They’re also rated as one of the best sprays for controlling bed bugs. This means that the company name is reputable and you can trust the brand. The customer service is also at a high standard. You can contact them on a 1-800 number and they usually answer and deal with inquires quickly. Another great part of this company is that they try their best to help their customers deal with their problem. This is through video tutorials, clear labelling on products, and offering people direct advice on the phone. Full refunds and free shipping are available. However, refunds aren’t offered for bed bug products, including Harris Bed Bug Killer. Their website states that you need to use a range of measures to control the bed bug problem and one measure alone is ineffective. If you've been following any of our advice, then this policy shouldn't surprise you. Harris Bed Bug Killer is a bed bug spray. You should understand that sprays are just one tool in your arsenal to help kill bed bugs. Remember, bed bugs are one of the hardest pests to eliminate without professional help. If you use a spray such as this and nothing else, I guarantee you'll end up in the same spot you started, still with bed bugs. That is what we recommend consulting with a professional before beginning and bed bug removal treatment. The active ingredient in Harris is deltamethrin, which is a pyrethroid insecticide. This is a neurotoxin that acts by destroying the nervous system of the bed bugs and causes paralysis. You can get better results if you use it in combination with other products. In recent years, it’s becoming clear that bed bugs are developing resistance to deltamethrin. This study shows that 88% of bugs exposed to the insecticide at normal doses survived. Despite the claims that this product works, studies suggest that more bugs are becoming resistant, which is one of the main reasons that bed bugs keep spreading! The ease of use varies. Some people say it's easy to use, others hate the setup. The bottle comes with a nozzle that you use to spray the liquid. It can occasionally release too much liquid at once and the spray can be difficult to aim. Another disadvantage is the size of the bottle. The size and bulk make it less versatile to use around the house. I found that it’s easier to use if it’s poured into a smaller container. This makes it easier to carry. Despite these difficulties, it takes less than 10 minutes from opening the packaging to applying it. You don’t need to mix it with other chemicals before using it, however, some do and claim to get better results. The product is registered with the EPA as safe to use in your home around people and pets. But, it’s toxic to fish and other aquatic life. Overall, there aren’t many reports of people falling sick after using it, and I haven’t found any reviews of Harris being harmful to pets. You should be aware that deltamethrin can irritate the skin and in can be neurotoxic to humans in high doses. Some people may also develop an allergic reaction and it can stimulate asthma attacks. You can read more about the potential effects of high doses of deltamethrin here. Harris contains sodium lauryl sulfate, which can cause dermatitis after contact for a long period of time. This should be a consideration when applying it onto your bed sheets. Overall, Harris is safe to use around your pets and children, providing you don’t keep fish. Take care not to have prolonged exposure to the chemicals as with most insecticides. Users claim to have success with Harris when it’s used with other anti-bed bug products. The people who do see results use this over the courses of months of daily spraying. Studies are showing that pyrethroids, in particular, deltamethrin are﻿ fast becoming ineffective. Bed bugs continue to develop a resistance to these insecticides, which makes these types of sprays useless. If you're interested in learning more about how or why bed bugs are developing resistances to pesticides, check out this article. Now that we understand the features and limitations of Harris, let’s see how it compares against some of its competitors. Deep Reach Fogger uses an aerosol. This is sprayed around the room and claims to disrupt the breed habits. It also says that mist can get into the hard to reach places where the bugs are hiding and have residuals that last for up to two months. Deep Reach is non-stain, doesn’t leave any residuals, but has a pungent smell. The product sounds good, but bombs and foggers are ineffective against bed bugs. The mist can cause the bugs to scatter, which can increase the size of the infestation or make them bury deeper and become harder to control. As a result, this makes the residual effects redundant. Harris is odorless and you don’t have to leave the house for several hours. The bugs may develop resistance to the insecticide. But the residual and effects would be much higher than Deep Reach. 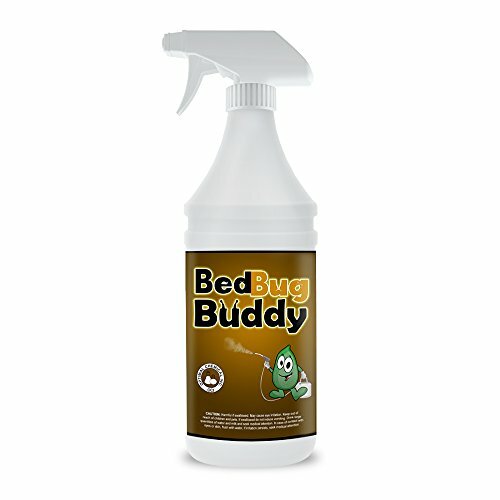 Bed Bug Bully uses an odorless and non-toxic liquid spray. The products claim to kill the bugs at all stages of their life cycle using a combination of essential oils. This product is better on one hand because it’s nontoxic and has almost no adverse effects on human or animal health. You can also use this around fish. On the downside, essential oils don’t have much effect on bed bugs and it doesn’t have long residuals. Neither are great against the bugs, but Harris may work slightly better as a deterrent or in combination with other products. Check out our full review here if you want to learn more about Bed Bug Buddy. 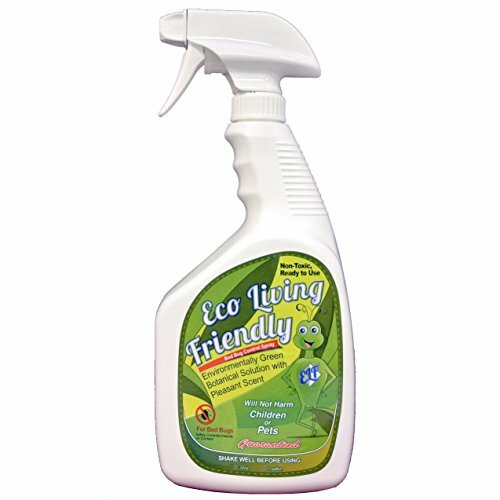 Eco Living uses a yeast-based protein as a non-toxic insecticide that you apply as a spray. You need to use this on a daily basis for up to two weeks before you start to see any results. This means it has a delayed action. Eco Living also leaves a lingering odor and doesn’t have much residual effects. Compared to Harris, Eco Living isn't that great. It can sometimes kill the bugs that it makes contact with and does work as a deterrent. The delayed action also takes three weeks of daily use before you start to see results. Studies show that bugs are developing resistance to the insecticides in this spray. Some users swear by the product and say that it can work miracles. I’m more skeptical and wouldn’t use this product on its own. You may get some benefits from using this as a deterrent or to spray around the house as a preventative, but the effectiveness is limited. With bed bugs our advice usually remains consistent. Pick up the phone and call an exterminator before implementing your own strategy. This is mostly because bed bugs can quickly get out of hand if applying products in the wrong way. What to talk to someone right now? Dial 855-324-0823, which is our direct line to our Terminix partners. Press "2" on your keypad and you'll be connected to an agent to help you further. I hired an exterminator and I got bit the same night. Even saw one on my mattress crawling around. He came back twice to spray and never got rid of them. $1,000 down the drain. Bed bugs are one of the hardest bugs to get rid of. It sounds like you got matched up with a not so great exterminator. I’m not sure how many exterminator you called before picking one, but definitely take the time to vet 6-12 exterminators before deciding on one. Create a list of 10-15 questions and ask each prospect and listen to see how confident they are. Can they provide success stories of previous cases? Do they sound like they know what they’re talking about? These are all things to consider before deciding on one. an allergic reaction if it get in contact with your skin? The reason I ask is I got some a couple of weeks ago and the next day had these little bump on my arms and my feet and ankles. Hey Shelley, thanks for the comment. I’m definitely not a doctor, but it is possible to have some kind of reaction if it comes in contact with your skin. As I’m sure you know, there are lots of potent chemicals designed to kill bugs. The mixture and chemical profile can definitely have a negative reaction. I would do my best to avoid touch and/or use gloves and a respirator when applying any type of pesticide. I have just found out we have bed bugs(early stages), We hopefully caught it so we can get rid of them. My Question is once I treat the mattress and box spring with the spray till it’s a little damp. How long do I wait to put the Protector covers on? I was told by some to let dry for at least 1-2 hours but others told me to put covers on right away? I’d wait until dry. Doubt there’s any added benefit from a freshly wet mattress from bed bug killing chemicals. Once the cover is on, you should be good to go!